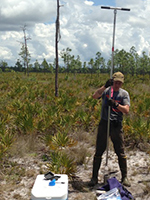 Dr. Ben Bond-Lamberty taking samples in the field. 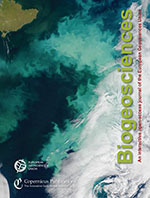 An influential paper co-authored by Pacific Northwest National Laboratory scientist Dr. Ben Bond-Lamberty was recently listed as one of the 10 most-cited papers from Biogeosciences in 2014. Published in 2012, the paper finds that scientists haven't yet come to a conclusion on what happens when soil freezes or gets very dry. The study reviewed 50 years of literature and found that there is a wide range of results when soil is dried and then rewetted, or frozen and then thawed. The paper received attention because of its comprehensive review, as well as its recommendations to address the current gaps in knowledge. Learning more about what happens when soils are rewetted or thawed is important because transitions like those will be happening more often in parts of the world experiencing climate changes. Current models don't simulate such dry-to-wet or cold-to-warm changes very well. Bond-Lamberty is a research scientist at the Joint Global Change Research Institute, a partnership between PNNL and the University of Maryland. He received a Ph.D. in Forest Ecosystems Ecology from the University of Wisconsin, Madison. Reference: Kim DG, R Vargas, B Bond-Lamberty and MR Turetsky. 2012. "Effects of Soil Rewetting and Thawing on Soil Gas Fluxes: A Review of Current Literature and Suggestions for Future Research." Biogeosciences 9:2459-2483. DOI: 10.5194/bg-9-2459-2012.